76 x 57 cm - 29 7/8 x 22 7/16 in. Mme X., Paris [Browse] - Vente Paris, février 1919, n° 76 (repr.) - Roger G. Gompel, Paris, circa 1924-1937 - C. M. de Hauke, New York [Lemoisne] - Jacques Seligmann, New York, 1939 [Lemoisne] - M. et Mme Diego Suarez, New York, circa 1939 - The Art Institute of Chicago, 1980. Paris, galerie Georges Petit, 1924, n° 152 (repr.) - Paris, Bernheim-Jeune, 1936, n° 28 (repr.) - Paris, musée de l'Orangerie, 1937, n° 113 (repr.) - New York, Carroll Carstairs Galleries, 1938, The 1870's in France - New York, Jacques Seligmann Galleries, 1939, n° 18 (repr.) - New York, Word's Fair, 1939, Masterpieces of Art - Cleveland, Museum of Art, 1947, n° 37 - New York, Wildenstein & Co., 1949, n° 52, repr. 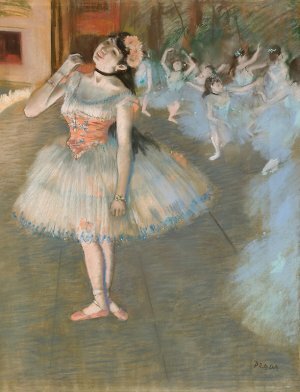 p. 41 - Los Angeles, County Museum, 1958, Exhibition of Works by Edgar Degas - The Art Institute of Chicago, 1984, n° 41, repr. p. 94 - The Art Institute of Chicago, 2015-2016, Degas: At the Track. On the Stage (Sans catalogue). Frankfurter, Art News, décembre 1938, p. 11 (repr.) - Rouart, 1945, p. 17 - Lemoisne, 1946-1949, II, n° 598, repr. p. 339 - Browse, , n° 58 - Lassaigne, Minervino, 1974, n° 751, repr. p. 121 - Boggs, McCullagh, cat. exp. The Art Institute of Chicago, 1984, cat. 41, p. 94-95 - The Art Institute of Chicago, 2015-2016, Degas : At the Track. On the Stage (Sans catalogue).